hello when im trying to run make for the initialload it comes back and says initialload upload error 1, what does that mean ? just to update i understand the error was saying it couldnt open the device and i have changed the makefile to show ttycom3 which com3 is where the serial adaptor is on but still gives me that error. Make it just com3 no tty. You are positive that it is com3 that the USB programmer is in? 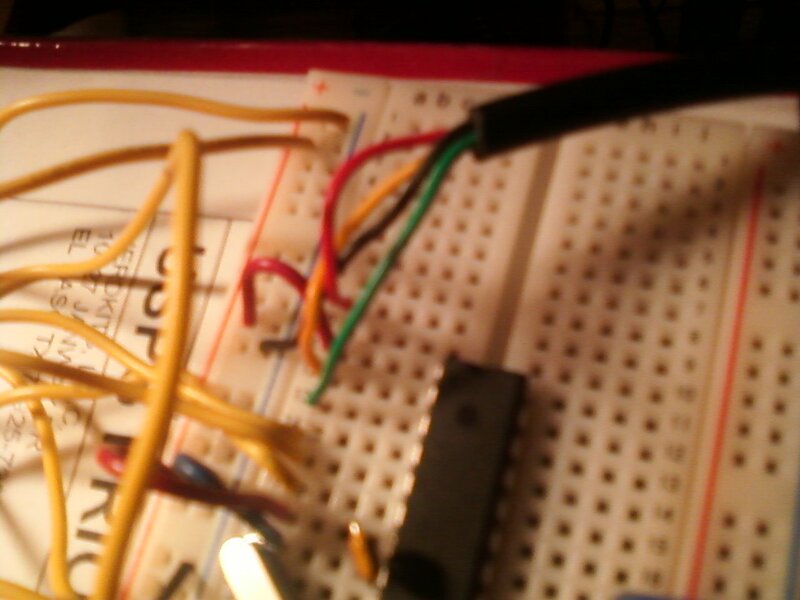 Double check that you have your programmer connected to the breadboard properly. can you take a picture of your nerdkit setup? Double check your programming header wiring. Make sure you have the correct com port and that the driver is installed correctly. It's just Com3 (com3?) no /dev!! i have checked my cabels for the header, i have taken the usb out a few times and plug it back in, i have undo the battery and move the switch going towards the chip, and still get the error for unbuffered memory. there was something mention about the settings for the port for where the serial adaptor is on , what settings should it be for xp home. i really do appreciate everyone's help i really do, thanks again. See if you can post a pic of your makefile. 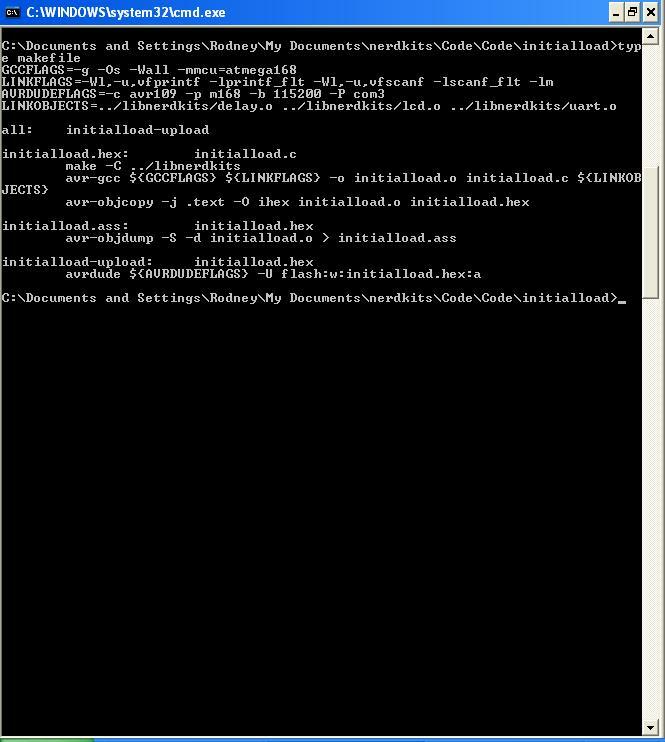 Instead of typing "make" at the command prompt, use "type makefile". This should output your file to the screen. Rodney, in your initial post you said you " i have changed the makefile to show ttycom3 which com3 is where the serial adaptor is on " That was why I said make it just com3. Then later when you post your command screen you obviously have it as /dev/COM3. Like Ralph and pcbolt said, and I did originally --- make it JUST COM3. The /dev/ttl stuff is for Linux and will not work in Windows. 1 here you go pcbolt this is the image you requested. I see you changed it, does it work now?? If not what error do you get? 1). Unplug the USB cable (both ends) and re-plug. 3). 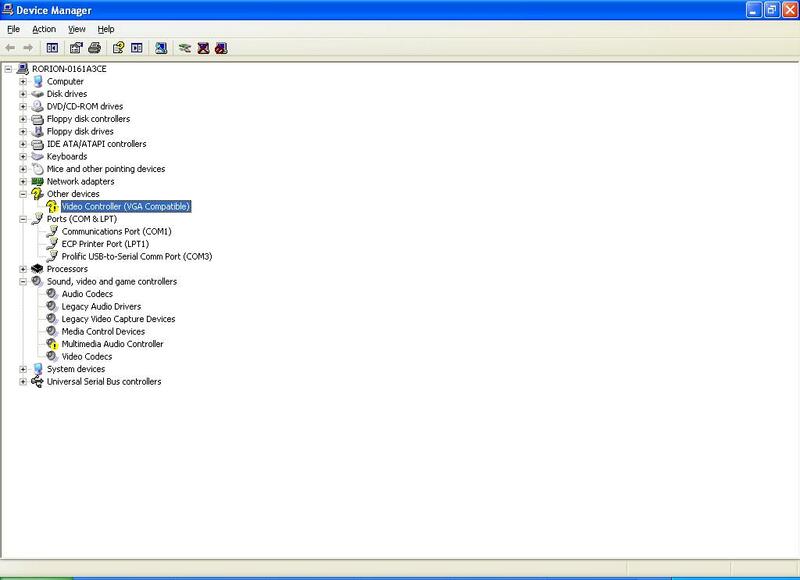 Disable COM3 in the Windows Control panel then re-enable. Right click on COM3 in the same window you show above. Click "Disable". When you the right click and hit "Enable", you may have to restart your machine. 4). In that same window, see if changing the default port settings will work. You'd need 115200, 8, N, 1. This is a long shot, the command line in the makefile should make the change on the fly. After a right click on COM3, go to properties and one of the tabs will have settings you can change. 5). And of course, re-check wiring (which I'm sure you've done already). Help.... i let the project rest for awhile decided to come back , it still giving the same error, i battery seems to power the lcd so i dont think its the battery, and i have checked all of my wiring so i dont know what else i can try ? any suggestions pls ? Could you post a screenshot of the error message...starting from where you type "make" to the end of the error?